I made tonnes of Christmas presents this year for various friends and family. Small fabric things are nice and light to send back to ol' Blighty, and my colleagues love it when I make them things. It's still a big novelty for them! 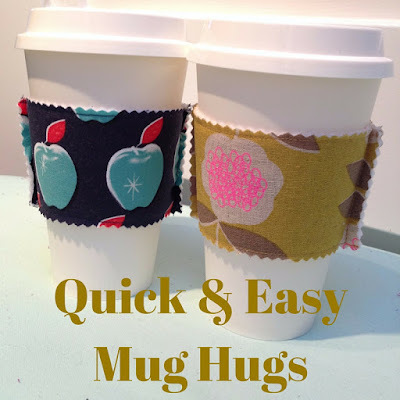 These mug hugs are quick and easy, and perfect those special people in your life who love coffee. The cups in the photo above are from Nordstrom, but it seems that most big coffee shop chains sell them. To make your template, draw around your cardboard sleeve, adding 1mm or so at the top and the bottom, and 1cm at each side. Cut two pieces out of your main fabric and two pieces out of your felt or batting. You may need more fabric if there is a particular detail of your fabric print that you want to include, or if your fabric is one directional. Pin one piece of fabric and one piece of batting together, and sew them together along the top and the bottom, with a seam allowance of 4mm like below. If you don't have a sewing machine, you can definitely do this project by hand as well. Trim the edges with your pinking shears. Next, place the two pieces together, felt sides together and then sew along the sides with a 1cm seam allowance. Trim the sides with the pinking shears, et voila! You made a mug hug. How quick and easy was that? !